This past Friday, CATA was invited to speak at Mishkan Shalom, a Reconstructionist Jewish synagogue, at their Multifaith Seder. The theme for the night was “Food, the Immigrant Experience, and Justice.” Below is the talk CATA’s executive director Nelson Carrasquillo gave during the Seder. Feel free to read, comment, and pass it along to others. Thanks again to Mishkan Shalom for inviting us to be there and for the wonderful night. Thanks for the opportunity to speak on behalf of farmworkers at the time of Pesach Seder. On reading of the significance and context for the celebration, what struck me was that once the Emperor realized that they really needed the Jews, he wanted them back under the same oppressive conditions as slaves. This is relevant today given the present circumstance in which farmworkers and migrants are treated in the United States in particular. They want them to provide their services, pick the crops, wash the dishes, do the laundry, and take care of the kids while they really don’t want them to be around. They don’t pay them living wages, deny them work place protections and treat them as criminals for taking advantage and doing what for most people is undignified and slave work. On April 4, 1967 Reverend Martin Luther King spoke at Riverside Drive against the Vietnam War. He spoke against a brutalizing war that was the enemy of the poor; a cruel war against the Vietnamese while being concerned about the troops over there. He called for the “Madness to Cease” and that the challenge for the American people is to stop it. After almost 45 years this Madness continues and we most stop it. Thanks again for the opportunity to speak in the context of the SEDER. The food that we are sharing which is nurturing and good for our well being both physically and spiritually was hand picked by farmworkers. Farmworkers who are from other countries, who if given a chance would not be here, are probably doing the same thing, sitting at the table with their families eating the food that sustains them. Except that the cost of a chicken in Moroleon, Guanajuato, would be about 50 pesos, or 5 dollars. While their income for a day’s labor would be about 150 pesos. This means the equivalent in the USA of roughly two hours of work, so you have to work two hours in order for your family to eat a chicken. Under these conditions no wonder why migrant workers look north as the solution to their desperation. This is relevant, since NAFTA, the flow of goods, instead of moving north are going south, and what moves north are migrant workers looking for jobs. At a time when the Borders are supposedly open for the movement of goods and closed to the movement of workers. In Mexico more than a million small farmers lost their lands while at the same time more than a million and half farmworkers moved to the USA as undocumented. Crescenciano is a Board member of CATA, a husband and a father of two beautiful youths. He has been away from his home for the last two years. Before that it took him three years to be able to visit his family. He speaks with them on a weekly basis by phone. He tells his children how they have to comfort themselves by phone. His wife has a form of progressive rheumatism that is slowly undermining her survival capability. The last time that he returned from Mexico, it took him 7 months. Two months to cross the border with a coyote and five months to travel from Los Angeles to south Jersey. He was able to get a ride with a coyote and forced to stay within the van for seventy two hours straight until we were able to pick him up at two o’clock in the morning in a parking lot. He only works during the season and for food during the winter he is dependent on charity. If he returns to Mexico to be with his family it will almost be impossible to pay for the medicine that his wife needs. I don’t know how many people realize this reality, but this can not be an unintentional consequence. In other words, of the values that drive this MARKET BASED society, cheap labor is one of the main principles for ensuring adequate margins of profits, and the wider the gap the better. 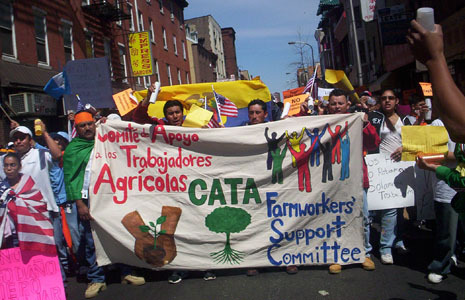 The inability of the farmworkers in the United States to make a living in their home country is a direct result of the trade agreement which has only benefited the rich. We benefit but don’t want them here. Farmers, once their crop is picked, want the workers to leave. To be persecuted and treated as criminals. Let me tell this story, in 1997 the Farmworkers organizations were engaged in a dialogue on how we could act together to promote the organization of farmworkers nationwide. The meeting was in Toledo, Ohio and FLOC was the host. As part of the meeting, the discussion on how best to influence Congress to enhance workers protections as well as to articulate opposition to the H2A program was a significant portion of the agenda. This included visits to farmers who had H2A workers to inquire on how they perceived the program. You can not imagine how I felt when the first farmer that we met with expressed without any qualm his displeasure at this lawyer from Philadelphia that almost single-handedly changed the conditions under which his H2A workers were operating. Should I say his name? What needs to be done to stop this madness requires each of us to question ourselves whether we want this situation to continue and to be clear as to what extent we are accomplices. If so, by all means keep silent or otherwise ask yourselves what can be done and how it must be done. In Pennsylvania stop the madness in the proposed criminalization of undocumented worker thru the proposed legislation. Demand your representatives to act in honor by dignifying the values of life as opposed to death when they bow to the God of Greed. Hold them accountable and demand from them a response. Do the same for the federal level. Advocate electoral reform that would take away the ability of corporations to finance elections; instead promote one person one vote concept to take back the democratic process. They haven’t finished the roll back of the safety nets and the undermining of workers rights; for the vast majority of elected officials in Congress for none of them are dependent on Social Security to maintain their status. … But as Martin Neimoeller said: How soon we forget? Become a friend of CATA and be a supporter. Support Friends of Farmworkers and Art Read. More than anything else; be a Voice against Injustice.